I always felt empty as a kid, and some nights I feared I might wake up on the ceiling, floating like a hollow barrel on a dark sea. My Aunt Theo often tried cheering me up, but it wasn’t until I happened upon one of her secrets that it finally did any good. Not wanting to stop mid-experiment, I decided to keep quiet and ducked behind some boxes to hide. The attic had a single, small window that threw in four bars of glinting yellow sunshine. Aunt Theo moved into the light and her long silver hair gleamed bright as a shield. She turned, looking for me, but stopped when one of the boxes against the opposite wall reached out and grabbed her attention for itself. “Amy?” she called again, this time to confirm my absence rather than search me out. Nodding to herself, she bent to rummage through the box in question and I noticed for the first time just how nicely shaped her bottom was. Large and lovely and simple, like a mango the size of a beach ball. When she stood back again, she did so with a telescope in hand. The kind a pirate uses, I realized, eyes wide. 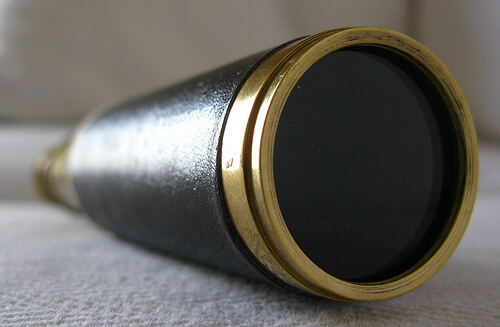 A spyglass. It was a dark wooden thing with gold rings smiling around each of its subsections. Aunt Theo handled it with a gentleness that was almost reverent, before tucking it beneath her arm and slipping her pants down around her knees. I covered my mouth to make sure she couldn’t hear me breathing. Mom had once told me that all women had the same parts down there, but Aunt Theo’s were definitely different from mine. Where I was all hairless and smooth and small, she was big and bushy and tangled, like one of the neighbor’s, Mrs. DuPont’s, armpits. Reaching down, Aunt Theo ran her big fingers through the hair and rubbed all around in it. She looked upward and closed her eyes, sighing. Then she used the spyglass in a way I’d never seen any pirate use it, pushing the skinnier end up beneath her hair for all her insides to look through. The way her hands vised around that spyglass, pulling it open and closed, open and closed, I knew immediately I had to try it for myself. When she was finished, she wiped the spyglass off using her t-shirt, which came away shiny-wet, as if a big, handsome snail had marched over her middle. I waited to hear her creak on the ladder again, waited ’til her footsteps were gone down the hall, and then darted out to take the still-slick telescope for a spin. It slipped up inside me real quick, like ice cream slipping down a throat. But where Aunt Theo had pulled it in and out, open and closed, my body just dragged it straight up and away. Swallowed. Gone. At first I was frightened. What if Aunt Theo finds out? What if I get a stomachache that never ends? What if something inside me starts using it to spy on the world outside? But then, Aunt Theo never asked about it. And there never was any stomachache, either. And if something had been inside of me to begin with, it never seemed much troubled by the addition of an old spyglass. It wasn’t for another seven years that I finally got to try out Aunt Theo’s technique on another person, but I didn’t let those years go idly by. For the time I couldn’t spend practicing on other people, I dedicated myself to seeing what other household items could be fit up inside me. If a spyglass could, why not a banana? A record player? A baseball bat? I had particular success with the rope tiebacks off the living room curtains, and I think it was the frill on the ropes’ tassels—the slippery way they licked over me as I drew them inside—that inspired me to start trying things from outside the house as well. Everything from flowers to fountains to bicycles. But my favorite by far was clouds. There was just something so cool about them, and so bright. But no matter how much I fit inside me, the emptiness never filled, and somewhere in the back of my mind, I knew that old dark sea was still waiting to carry me away. It wasn’t ’til I tried fitting in my first monster mask—a vampire’s face, its rubbery teeth painted red for blood—that I was finally caught at the enterprise. He was Sid Schaefer from Hair & Makeup, a strangely beautiful man with large, hairy hands. He stood frozen in the doorway of the little dressing room, shocked, and stared at me. We’d started work at the studio around the same time as each other. I was still in school then, training to be a modern-day William Castle and interning for the studio as much as I could. And even though Sid wasn’t an intern or a student, he came in for all my odd hours just so he could pretend running into me was an accident. He was dopey and weird and I’d been in love with him from Day One, but nothing had ever come of it before. The dark sea had risen up above our eyes by then, and so it’d never occurred to either of us that we might be loved in return. He swallowed so hard I heard it from all the way across the room. He was starting to sweat and to clench and unclench his hands as if something important was slipping rapidly away from him. “Sid, wait—” I caught him by the arm. He shivered under my hand and when he looked up at me then, I knew exactly what he wanted. His eyes were dark and bright at the same time and I felt meltingly glad to be looking into them. I wanted it too. He blushed, embarrassed. “I can’t,” he said, as if I’d asked aloud. Get wood. I’d heard the phrase a million times over, but it’d never before transported me to a full forest the way it did hearing him say it. In between the trembles in his voice, I heard leaves rustling and wild things howling. I heard creatures shifting in the moonlight. Ashamed, he shook his head. “I’m useless,” he said. There were tears in his eyes and my heart punched around in my chest at the sight of them, kicking over boxes and file cabinets. It was even easier than I’d hoped it’d be, broad shoulders, bony hips, and all. He fit in so well and so full. Everything’s so bright in here, I felt him howl, laughing, running, licking, dancing. Ducking between trees and clouds and rocks inside of me. Seeing the moon shine through my eyes. Spying new things out an old pirate’s spyglass. Everything’s so bright, I agreed. So bright and so full. K.C. Mead-Brewer is a writer and editor living in beautiful Baltimore, MD. Her writing appears in a variety of publications, including Cold Mountain Review, Natural Bridge (forthcoming), Litro Magazine, Menacing Hedge, and SQUAT Birth Journal. She also serves as an Editor-at-Large with Cleaver Magazine and is a proud member of The Roving Writers, a small group of wild women artists who got their start together at Hedgebrook: Women Authoring Change.